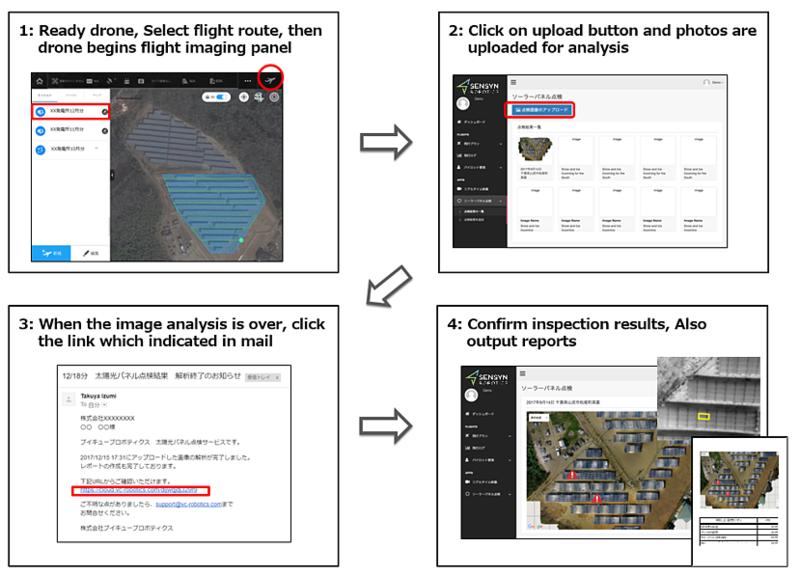 Solar Power Plant Inspection Package｜Solution｜SENSYN ROBOTICS, Inc.
We have released an inspection package capable of automating the whole inspection process from filming solar power panels using drones with automatic navigation function and identifying abnormal spots (hot spots) with image recognition and analysis using deep learning, to reporting inspection results. We provide a service that allows inspection work to be performed with greater accuracy and in a shorter time compared to the traditional manual inspection. Using drones with automatic navigation to quickly film solar panels that until now must be checked one by one manually. To inspect 2MW manually usually take about 4 days. However, this service can complete the inspection in just about 15 minutes. Hot spots are sometimes overlooked in manual inspections. However, the accuracy of detecting abnomalities improves with this service since the drones film solar panels while conforming to the panel angle. This service is also useful in terrains that are difficult to inspect manually. Until now, panel inspection using drones required external operators, which limited the frequency of the inspection. By simplifying and automating drone operation, this service makes it possible to carry out inspection frequently even with the inspection staff who do not have any special technical know-how. It is also possible to capture the changes over the years since users are able to manage inspection result history. 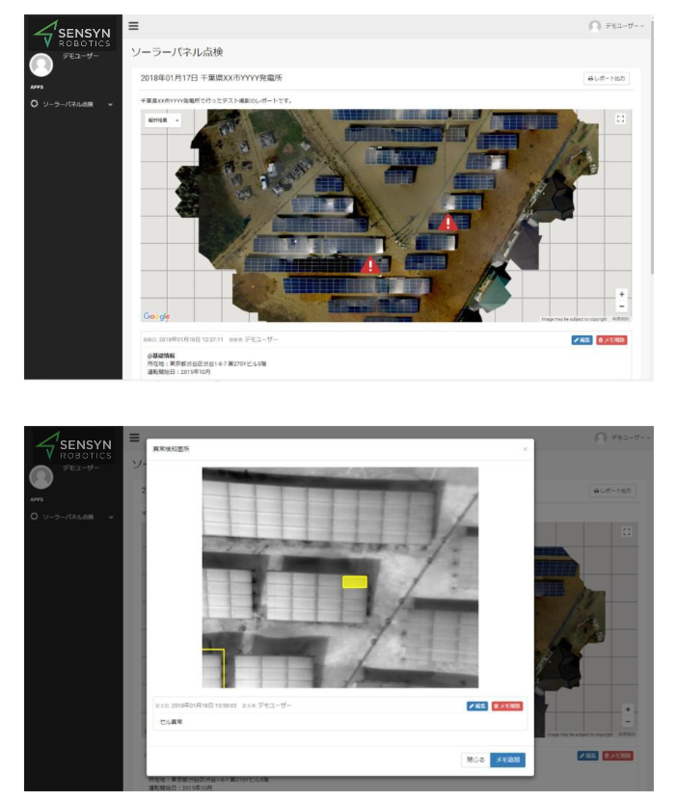 Although the filming man-hour is reduced in drone inspection in general, the process of cross-referencing the images in which abnormalities are detected with the corresponding panels is time consuming. However, this service makes it possible to generate inspection result report in a short time since the process from detecting abnormal spots to identifying the corresponding panels is carried out automatically using deep learning.